As hand-crafted beer continues to diversify and mature, we're starting to see more breweries cater to a different type of drinker. A market previously dominated by wine and cocktails, you're now almost as likely to see beer at the tables of your local BYOB restaurant. High end restaurants have also taken notice as an increasing number of menus from the hottest chefs in town are built with beer in mind. Great beer and food have always been quite the pair, something that people everywhere are starting to remember. You won't find a bigger proponent of this idea than former chef, and Founder of Moody Tongue Brewing Company, Jared Rouben. Cutting his teeth in the kitchens of New York and Napa Valley, and the brew houses at Rock Bottom and Goose Island Clybourn, Jared brings a unique perspective to Chicago beer. Making waves last year with their first offering, a $120 shaved black truffle Pilsner, each Moody Tongue brew since offers a simple, ingredient-centric twist on tried and true styles. We sat down with Jared in their rapidly expanding Pilsen brewery to find out what drives their approach to some of the most unique beers seen in Chicago yet. Yea, I started there around 2009, and was there for a couple years, maybe 2012... don't hold me to it. I had a great experience there. Working with John Hall, he's just a wealth of knowledge and a very kind man. He's certainly someone to learn from. Reggie, the general manager, is also not only a leader but a fantastic guy. Jacob and Jon, who you hired, were telling us how little brewing experience they had coming in. You must have really seen something in them to bring them into the fold. Jacob was a cook and Jon worked over at Erehwon. But they both had wonderful work ethic and great attitude. For me, when I'm looking for candidates to work alongside, I need someone who enjoys working, has a strong work ethic, and has a positive attitude. They smile when they get to work and they smile when they leave work. It's brewing, there's not much to be upset about. It was a pleasure to work with both of them. You must have been there during the sale to AB. How did you react? We were always a separate entity at Clybourn. But I think there was just mutual curiosity. When AB came in, they just wanted to learn everything. They took the time, asked a lot of questions, and wanted to know why. It was really nice. The fact that they cared to ask those types of questions, they certainly didn't need to, it took a lot of thought. I was curious in exchange. I wanted to see what their goal was and I think they were curious to explore and see what they had just purchased. It was a pretty exciting time and I think everyone was just figuring it out. I think it turned out pretty well. They have fantastic beers all over the country and it seems like the brewers are happy. So going back in your history, you started brewing at Rock Bottom? That's correct. I had the opportunity to work with Tim Marshall who's the brewmaster at Solemn Oath and Greg Matthews who's now the brewmaster at Platt Park in Denver. I've been really fortunate. I've been around this brewing scene for a while now and had the opportunity to work with great people. We imagine you've crossed paths with Pete Crowley during your time at Rock Bottom? Of course, anyone who's worked there has crossed paths with him. He hooked me up with my first job. He's the one who connected me with Rock Bottom Lombard and Rock Bottom Warrenville. Yea, he's a fantastic leader in this brewing community. Was Rock Bottom your first foray into the brewing world? Well I was staging at Chelsea Brewing Company in New York. After graduating Siebel, I got hired by Rock Bottom. Sorry, what exactly is staging? It's you volunteering. Staging [pronounced "stahzje-ing"] is just a term used in kitchens; when you go and you spend the day trying to understand the process, and learning as much as you can from an expert. So at some point you made the jump into beer from the culinary world. That happened at Rock Bottom? No, I'm classically trained at the Culinary Institute of America in New York. In the first week of culinary school I tried to join the wine club and they said I had to have a minimum GPA and that each event would cost around $25. Well I hadn't really had a grade yet and $25 seemed a little bit steep. So I started a beer club the next week. That brew club still exists. I would bring in breweries from the northeast, like Dogfish Head, Sam Adams, Magic Hat, and Brooklyn. We would use these beers as an ingredient or pairing item. It was a wonderful opportunity to view beer as an ingredient and dissect the flavors and aromatics the same way we were dissecting our dishes in the kitchen. From there I went out to the Napa Valley and cooked at the Martini House, a Michelin starred restaurant. One of my responsibilities was to go to the farmers market and get ingredients and I started getting additional ingredients for my homebrews. All of sudden, my homebrews became a lot better because I started viewing them as dishes that I'd make in the kitchen. It rests on three very simple principles, that Moody Tongue rests upon today. They are, source the best ingredients, handle it properly, and knowing when and why to incorporate it back into the beer. How did you learn to understand the ingredients and how they relate to beer? Well a lot of that, understanding ingredients, stems from experience in the kitchen. We're not really interested in experimenting with our ingredients. We're interested in understanding them. I don't think you're going to walk into any great restaurant and say, "Hey, we really didn't know what we were going to do with these raspberries. We just plopped it in here to see if you like it." It's more like, "Hey, we're going to make sure it's perfect, then we're going to share." So we're actually quite conservative before we incorporate any ingredient. We look for something we think is really special and makes sense with beer. And I'm not just saying beer in general, I mean a specific style. We start to bring the two together. We start to see their applications. We'll bake it, we'll fry it, we'll sauté it. We'll see it in all different forms and see how it changes that ingredient and if it's a good fit for that style of beer we're looking for. That all came from going to those farmers markets in Napa, taking those great ingredients, and applying it to food I was making, and my homebrewing. After that, going back to New York, I would continue that exploration of ingredients and knowing where to source it, from which farm or purveyor, and why. We ask a lot of why around here. Why are you doing this? Why are you putting it in? Any great chef is asking themselves, "Does this dish need this ingredient?" You have to protect the integrity of the dish, just like you protect the integrity of the beer. That doesn't mean throw everything in there. We're looking to bring to life flavors and aromatics, one ingredient, or one beer style. Some of the best food we've ever had is the simplest. It sounds like that's what your aiming for in your beer. Exactly, when you look at Moody Tongue, we're not about flash and bang and fireworks. Moody Tongue just means someone with a discerning pallet. I guarantee you don't know anyone who goes into a restaurant or bar and says, "Give me your most average beer and give me your most average dish." They want the best. We have to be held accountable for that. Can you talk a little about your thinking behind this Lemon Saison? It's pretty fantastic. The Saison is light, it's bright, and it's refreshing. The yeast strain itself traditionally has a little bit of white pepper, a little bit of lemon, depending on the hops you use. We thought we could continue to bring that to life. We want to draw you in on those aromatics and then draw you in with the flavor profile without exhausting the tongue. It's wonderful for seafood, whether its scallops or fresh fish. I always envision myself taking that knife right there, slicing the lemon, then crushing it right over my seafood. We would have guessed a lot less than that. Thank you, we take that as a compliment. We don't look at alcohol as a flavor profile. If we do our job well, then you experience the flavors that we want you to experience. So no 14% beers on the horizon for Moody Tongue then? We don't have any right now, but we'll certainly participate in FoBAB. We do our best to make sure the bourbon, vanilla, molasses, caramel, and toffee, show themselves – not the alcohol. Oh yea, I'm originally from Louisville, KY. So we have some really nice relationships with barrel producers down there. Our father is not the biggest beer guy, but he is the biggest bourbon guy. That's how we sit down and chat. So looking back, your first production beer at Moody Tongue was the truffle Pilsner correct? It came with quite the price tag ($120/bottle). It was. We like to remind people that all of our beers are priced as a reflection of the cost of the ingredients. If you can find any of our ingredients on the cheap, you tell me. I'd love to change it up. We use the best ingredients, and most of the time when you're using ingredients of that caliber, it costs money. And that really got you on a lot of people's radar, right off the bat. We didn't do it to create awareness and exposure. We did it because we had the opportunity. If someone comes to you and says they have one of the most beautiful ingredients in the world, and asks if you'd like to create a beer with it, of course you do! You take your shot when you have it and you don't take that for granted. You ask a lot of people that deal with truffles on a day-to-day basis. You get as much information as possible. I asked my culinary teachers and chefs in New York. When creating a new brew, would you say you're more inspired by the beer style or the ingredient? We always start with the style. If we can't make the traditional style, it's probably not a good idea to continue with anything else beyond that. We focus on the style first, and then if there's an opportunity to incorporate an ingredient, where it makes the actual beer better, then we do it. But if it doesn't make the beer better, we really don't have an interest in it. We always say, we're not trying to put parsley on the plate, it's got to contribute a better flavor and aromatic, otherwise it's just not necessary. So what about this space here in Pilsen. What made you settle on this spot in this neighborhood? I went to about 55 different spaces. I knew what I wanted and that just came from having worked at other places and seeing what I didn't want. I needed at least 9,000 sq ft and I have 10,000 here. I needed a great loading dock and I wanted natural light. I've worked in a lot of dungeons, which get's depressing. This used to be a glass factory so that whole front facade is windows and the sky lights open up. Another huge component was the neighborhood. I saw Goose Island and Revolution really connect with their neighborhood and grow with them. That's something I wanted to do. I like the food, I like the art, I like the music. It's Pilsen. There's a wonderful Hispanic culture and right down the street is Chinatown. For me, I think food first. I love Mexican food, I love Chinese food. It's kind of the perfect situation. But it's the people that really made the decision easy. There are a lot of young people that are excited about beer and it just felt like a natural fit. We feel fortunate to have been adopted and find a home here. People have been kind. Any plans to open up the space to visitors? We're building a tasting room and once that's complete we'd love to invite our guests in. At this time I don't feel like we're prepared to give people the experience they want when they come into Moody Tongue. How big will the tasting room be? It will be a little over 2,500 sq ft. Certainty a comfortable size. Any guess on the opening date for that? You tell me, it all depends on the city right? We want this to happen sooner than later. We have a great Alderman who's certainly helped us. We're excited to invite people in to share some beer. Any plans to have an onsite kitchen to compliment that beer in the tasting room? I think initially we're just going to focus on beer. We take our time with everything. We try to get a strong understanding of that first and if there's an opportunity we might incorporate something else. But it will be beer first. We've got to make sure we don't put the cart before the horse. Any plans to experiment or release other limited beers, outside of your core offerings? One of my jobs at Goose Island was to create a new beer every Thursday. Usually I would do two or three. I know what I do well and I know what I don't need to make again. I've scratched that itch. We put a lot of thought into what we create and we're not interested in creating anything that doesn't have a purpose in our portfolio. You're a bonafide brewer now, but what do you miss most about life in the kitchen? Well I haven't really left. I just have a different uniform and my pots are bigger. I still surround myself with people who have also worked in kitchens. You're still manipulating ingredients with time and temperature and making people happy. The only difference is now I get to intoxicate people. It's fun! Where do you see Moody Tongue a couple years from now? Hopefully on great menus next to great food. I like sherry, and I like scotch. Any sherry I can get my hands on. Liz Mendez over at Vera is the best person to speak to for that. It's a very special place and they do an exceptional job. I like sparkling water too. It's an odd thing to say but I feel like it refreshes the pallet. There are tons of local beers as well. What about a brewery in Chicago that intrigues you? Someone that surprises you? I think there are a lot of brewers that I've really appreciated and have helped me in my career. Pete Crowley, Will Turner, Tim Marshall, Greg Mathews, the Halls, obviously. These are all people that have helped me on my path. I think it would be difficult to find anything you wouldn't enjoy from those guys. There are so many breweries in Chicago, and everybody kind of does their own thing. 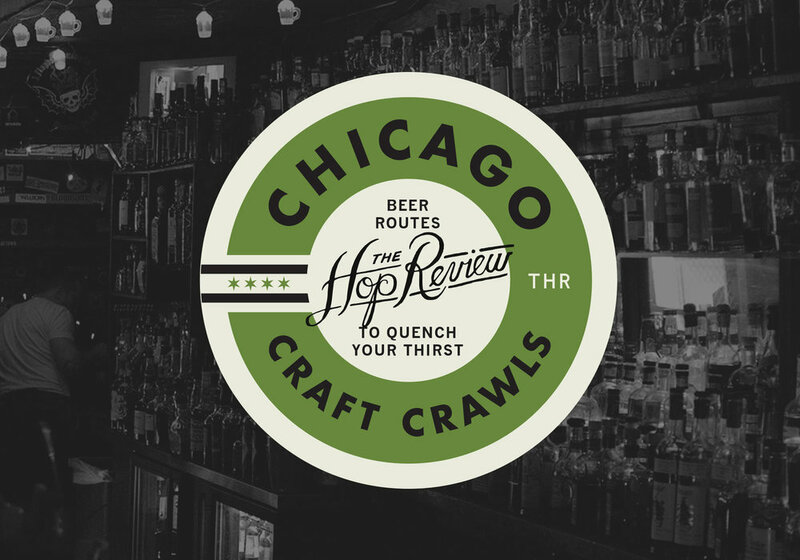 Half Acre, Off Color, Metropolitan, Solemn Oath, Haymarket, Revolution... you guys want me to keep going? Walk down the aisles and you'll see how spoiled we are. Cheers to Jared for having us down to Pilsen to talk shop over a beer and fruit from a local farmer's market. Be sure to get your hands on our their latest Steeped Emperor's Lemon Saison (our August Beer of the Month) and keep an eye out for the next food-centric brew from the guys at Moody Tongue. We'll certainly be doing the same.